In a previous life, James Cracknell spent too much time mucking about in a boat with big blokes wearing too much Lycra. He was lucky enough to win gold medals at the Sydney and Athens Olympics. After that he stupidly rowed across the Atlantic and did a race to the South Pole (both filmed by the BBC). After Antarctica he decided the cold wasn’t for him and entered the Marathon des Sables where he did okay and came 12th. At the time that was the highest place a Briton had ever come until Danny Kendall upstaged the Olympian. James’s MDS progress was filmed by the Discovery Channel. This was followed with another film documenting a journey from LA to New York: cycling from LA to Death Valley running through Death Valley then remounting and cycling Route 66 to Lake Erie, rowing Lake Erie then cycling to New York and finally swimming to the Statue of Liberty. Unfortunately James didn’t complete this journey as a fuel truck in Arizona hit him! Placed in a coma and a two-month stay in a Phoenix hospital, James was close to the edge. It’s been a long journey and one that is ongoing. 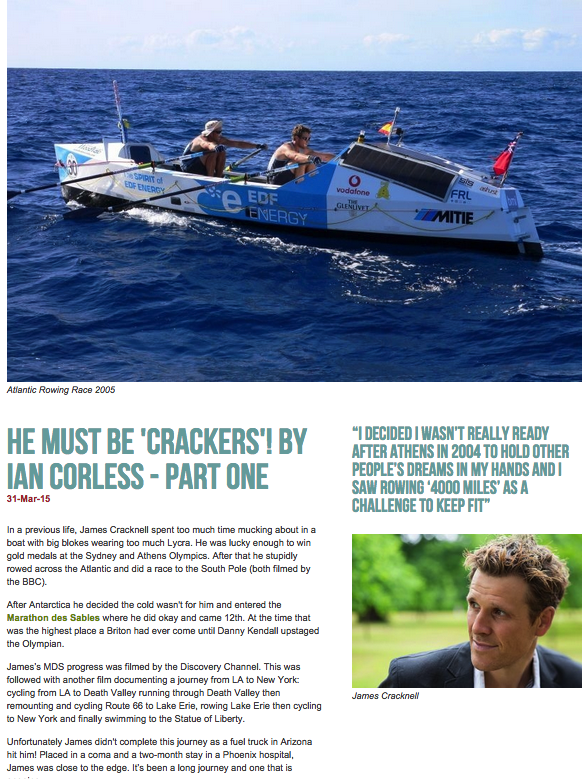 This entry was posted in Uncategorized and tagged accident, Adidas, Atlantic, ben fogle, Crackers, cracknell, Desert, gold medals, head injury, James, jamescracknell, Karrimor, MDS, new york, richterveld wildrun, rowing, Sahara by talkultra. Bookmark the permalink.